Objective: To investigate the outcomes of patients undergoing Hackett-Hemwall dextrose Prolotherapytreatment for chronic low back pain. Design: One hundred forty-five patients, who had been in pain an average of four years and ten months, were treated quarterly with Hackett-Hemwall dextrose Prolotherapy. This included a subset of 55 patients who were told by their medical doctor(s) that there were no other treatment options for their pain and a subset of 26 patients who were told by their doctor(s) that surgery was their only option. Patients were contacted an average of 12 months following their last Prolotherapy session and asked questions regarding their levels of pain, physical and psychological symptoms and activities of daily living, before and after their last Prolotherapy treatment. Results: In these 145 low backs, pain levels decreased from 5.6 to 2.7 after Prolotherapy; 89% experienced more than 50% pain relief with Prolotherapy; more than 80% showed improvements in walking and exercise ability, anxiety, depression and overall disability; 75% percent were able to completely stop taking pain medications. The decrease in pain reached statistical significance at the p<.000001 for the 145 low backs, including the subset of patients who were told there was no other treatment options for their pain and those who were told surgery was their only treatment option. Conclusion: In this retrospective study on the use of Hackett-Hemwall dextrose Prolotherapy, patients who presented with over four years of unresolved low back pain were shown to improve their pain, stiffness, range of motion, and quality of life measures even 12 months subsequent to their last Prolotherapy session. This pilot study shows that Prolotherapy is a treatment that should be considered and further studied for people suffering with unresolved low back pain. There is some consensus in the medical community on how to treat acute low back pain, but treatment of chronic pain presents many challenges and little agreement on standard of care. Nonsteroidal anti-inflammatory drugs and antidepressants provide some short-term benefit, but no published data warrant their long-term use.6 Manipulative therapy, physiotherapy, and massage therapy studies have also shown only temporary benefit.7,8 Long-term results on more invasive therapies, such as intradiscal electrothermal therapy (IDET) or surgery, have been poor.9,10 Some believe the poor results for the treatment of chronic low back pain stem from the fact that too much emphasis has been placed on pain arising from the intervertebral discs and not enough on chronic low back pain originating from the sacroiliac joint and ligaments.11,12 Because of the limited response to traditional therapies, many people have looked to other approaches for pain control. Prolotherapy (proliferative therapy), also known as regenerative injection therapy, is a nonsurgical injection therapy used to treat unresolved musculoskeletal pain and has shown some promise in relieving lower back pain.13 The procedure involves injecting soft connective tissue with one or more proliferants designed to provoke local inflammation, stimulating the body’s production of collagen at the injection site. The resulting growth of new ligament and tendon tissue is believed to alleviate pain. joints.14-16 Treatment of degenerative joint and spinal disease, including chronic low back pain arising from the sacroiliac joints, has also been reported with Prolotherapy.17-21 These reports have concentrated on Prolotherapy’s ability to decrease chronic pain. To evaluate Hackett-Hemwall Prolotherapy’s ability to decrease not only pain, but improve range of motion, exercise ability, and other physical and psychological factors important to those with chronic low back pain, this retrospective pilot study was undertaken on a large patient population with chronic low back pain. George S. Hackett, MD, a pioneer in the field of regenerative injection therapy, is credited with coining the word Prolotherapy (from proliferant and therapy). He brought the procedure into the mainstream and he, along with Gustav Hemwall, MD, developed current injection protocols.22 Their procedure is unique in that it involves treating a maximum number of structures in an area of pain with a substantial amount of solution, typically between 60 and 90ccs per treatment. When the interspinus and supraspinus ligaments are injured due to trauma, excessive movement occurs at the involved spinal segment. Injury to these ligaments alone can refer pain down to the heel, groin, or the perineum.32,33 Once damaged, these ligaments can no longer protect the disc and facet joint of the involved lumbar segment and excessive pressures occur. When too much separation of the spinus processes is allowed on forward bending, what results is a bulging disc. If the separation is excessive, a herniated disc will occur.34 The most common area where the above events take place is between the fifth lumbar vertebra and the sacrum.35 The fifth lumbar vertebra sits on the sacrum. Given that the upper surface of the sacrum is inclined downward and forward at an angle of approximately 40 degrees with respect to the horizontal plane, the physiology of such injury is apparent. When the lumbosacral ligaments between these two structures are stretched, the fifth lumbar vertebra begins to move down the sacrum. This causes undue stress on the outer layer of the disc (annulus) and, with time, fissures develop in the annulus, making the disc more prone to herniation. The interspinus, supraspinus, and iliolumbar ligaments are some of the ligaments that prevent this from happening.36 (See Figure 1.) The above scenario is the most common cause of ligament injury and is responsible for the majority of unresolved low back pain. Figure 1. Ligamentous structures of the lower back typically treated with Hackett-Hemwall dextrose Prolotherapy. In one analysis of 146 consecutive cases of undiagnosed low back disability, 94% of the patients were found to have ligament injury.37 A similar survey of 124 consecutive cases of unresolved low back pain revealed that 97% of patients possessed joint instability from ligament weakness.38 The sacroiliac ligaments were involved in 75% of the cases; the lumbosacral ligaments in 54%. In these cases, 50% had already undergone low back surgery for a previous diagnosis of a disc problem. This pilot study was conducted at Beulah Land Clinic, a free medical clinic located in southern Illinois, between the years 2001 and 2005. The clinic met every three months until July 2005, and all treatments were provided free of charge. Follow-up with patients was completed, on average, one year following treatment. Dextrose Prolotherapy, using the Hackett-Hemwall technique, was used on all patients for an average of one year. All lower-back ligaments were treated with a dextrose solution chosen as the proliferant because of its ready availability, low cost, and high safety profile. Each patient received 60 to 90 injections of a 15% dextrose, 0.2% lidocaine solution with a total of 60 to 90cc of solution per lower back treatment. Injections were given into and around the sacroiliac joints, as well as tender areas in the lower back. Thus, all soft tissue structures responsible for the intervertebral disc and skeletal stability at the vertebral-sacrum-iliac junction were treated on each patient at each visit. Injected sites included the sacroiliac, iliolumbar, sacrotuberous, lumbosacral, supraspinus and interspinus, sacrococcygeal and sacrospinus ligaments, as well as the gluteal and pyriformis muscle attachments on the iliac crest. Each site was injected with 0.5 to 1cc of solution. (See Figure 2.) An average of four lower back treatments, given every three months, was provided to each patient. Figure 2. Typical areas injected with Prolotherapy during low back Hackett-Hemwall dextrose Prolotherapy. Because nonsteroidal anti-inflammatory drugs (NSAIDs) inhibit the expected inflammatory process, patients were asked to discontinue use of pain medications during therapy, if possible. Pre- and post-study data was collected via telephone questionnaire by an independent data collection provider with no prior knowledge of Prolotherapy. Evaluation included current levels of pain/stiffness, disability, range of motion, medication use, quality of life measures, psychological factors, and whether the benefits of Prolotherapy continued after the treatment was stopped. Follow-up data was collected an average of 12 months following each patient’s final treatment. Patients were asked to rate the following: (1) level of pain and stiffness on a numerical scale from 1 to 10, with 1 indicating no pain/stiffness and 10 indicating severe crippling pain/stiffness; (2) level of disability as a percentage of normal daily activities they could perform prior to and following treatment; (3) range of motion on a numerical scale from 1 to 7, with 1 indicating no motion, 2 through 5 ranges of low-normal motion, 6 completely normal motion, and 7 excessive motion; (4) mobility ; (5) exercise time; (6) depressed and anxious feelings and (7) pre- and post-study use of pain medication. 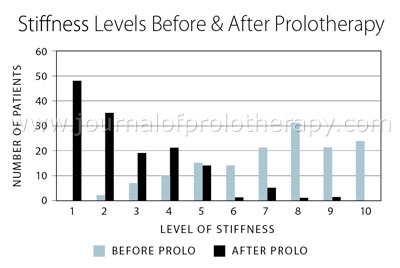 Patient percentages of the various responses were calculated before and after Prolotherapy. The patient percentages were also calculated for clients who answered yes to either of the following two questions:Before starting Prolotherapy it was the consensus of my medical doctor(s) that there were no other treatment options that he or she knew of to get rid of my chronic pain? and Before starting Prolotherapy my only other treatment option was surgery? Figure 3. Percent of patients who reported 50% or greater pain relief after receiving Hackett-Hemwall dextrose Prolotherapy. Figure 4. Pain levels before and after Hackett-Hemwall dextrose Prolotherapy. Figure 5. Stiffness levels before and after Hackett-Hemwall dextrose Prolotherapy. Figure 6. Starting vs ending range of motion levels before and after Hackett-Hemwall dextrose Prolotherapy. Figure 7. Walking ability before and after Hackett-Hemwall dextrose Prolotherapy. Pre-treatment, 14% of the patients were dependent on someone for activities of daily living (dressing and other general self-care). This went down to 4% after Prolotherapy. There were 12 patients prior to Prolotherapy that rated their dependency on someone else as greater than “minimum” assistance (i.e., needing help with greater than 25% of daily activities). Following treatment, only one patient reported needing that level of help. At one year follow-up, all patients stated that their initial improvements in mobility had continued since receiving Prolotherapy. Figure 8. Athletic ability before and after Hackett-Hemwall dextrose Prolotherapy. Prior to Prolotherapy, 57% had feelings of anxiety. After Prolotherapy, only 22% had feelings of anxiety. Before Prolotherapy, 49% had feelings of depression and after Prolotherapy, only 13% had depressed feeling. (See Figure 9.) According to the patients, 75% of the improvements in depression and anxiety have very much continued. Figure 9. Depression levels before and after receiving Hackett-Hemwall dextrose Prolotherapy. In regard to sleep, 72% of patients felt their pain interrupted their sleep. After Prolotherapy, 86% had improvements in their sleeping ability and 80% of patients stated that improvement has very much continued. Ninety-one percent of patients reported reliance on medication to manage their pain prior to Prolotherapy. Following completion of all injection treatments, 75% reported needing no pain medications. The average number of pain medications used per patient decreased from 1 to 0.3 after the study. For those patients who continued to need medication, 97% of them were able to decrease their use by 50% or more. To a simple yes or no question: “Has Prolotherapy changed your life for the better?” 97% of patients treated answered “yes.” When asked, “Are there reasons besides the Prolotherapy effect wearing off that are causing your continued pain/disability?” 80% answered “yes.” The patients noted the reasons for some of their returning back pain as the following: 52% said they stopped Prolotherapy treatments too soon (before the pain was completely gone), 16% re-injury, 12% new area of pain, 10% had increased life stressors, and 10% had other explanations for the pain. Of the patients whose pain recurred after Prolotherapy was stopped, 85% are planning on receiving more Prolotherapy. Ninety percent of patients knew someone who had received Prolotherapy. Seventy-one percent came to receive their first Prolotherapy session because of the recommendation of a friend. Ninety percent of patients treated considered the Prolotherapy treatment they received to be very successful. Ninety-nine percent noted that the Prolotherapy had been at least somewhat successful. Only one patient of the 145 noted that it made no change. No one said the Prolotherapy treatments made them worse. Ninety-four percent have recommended Prolotherapy to someone else. As previously noted, 38% of patients (55 in number) prior to Prolotherapy were told that there were no other treatment options for their pain. In analyzing these patients, they had a starting average pain level of 7.1 and after Prolotherapy a pain level of 3.1. 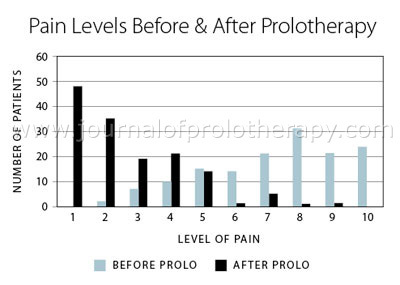 Prior to Prolotherapy, 58% of the patients rated their pain as a level 8 or higher. After Prolotherapy only 4% rated it that high. Results with stiffness were similar with an average starting level of 7.0 and an ending level of 3.1. The improvements in both pain and stiffness levels were significant. As a group, prior to Prolotherapy, 55% stated that they could not do at least 50% of the tasks they wanted to do. This decreased to 11% after Prolotherapy. In regard to range of motion prior to Prolotherapy, 35% noted less than half of normal back motion, but this declined to 7% after Prolotherapy. 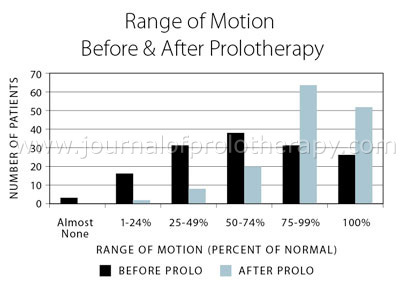 Before Prolotherapy only 42% noted a slight restriction of motion or normal motion, whereas after Prolotherapy this increased to 80%. Sixty-four percent had compromised walking ability and 20% could walk less than one block before Prolotherapy. After Prolotherapy, only 35% had compromised walking ability and 4% could walk less than one block. Before Prolotherapy 40% could not exercise at all, whereas after Prolotherapy this was down to 4%. Only 7% ranked their exercise ability as not compromised before Prolotherapy, but after Prolotherapy 58% rated it as not compromised. (See Figure 10.) For those patients on pain medication, 97% of them were able to decrease it by 50% or more. Seventy-eight percent of them were able to decrease their need for additional pain therapies by 50% or more. Before Prolotherapy, 60% felt at least some depression and 71% some anxiety. This decreased to 20% who felt depression and 31% who were anxious after Prolotherapy. Figure 10. Exercise ability before and after Hackett-Hemwall dextrose Prolotherapy in patients told that no other treatment options existed for their back pain. In regard to the question “Before starting Prolotherapy my only other treatment option was surgery?” 18% of the patients (26 in number) answered “yes.” In analyzing data on these patients, they started out with an average pain level of 6.0, which decreased to 2.1 after Prolotherapy. Eighty-one percent had a pain level of 3 or less after Prolotherapy. Their starting stiffness level was 6.1 and ending was 2.0. Both pain and stiffness improvements were significant. (See Figures 11 & 12.) Sixty-nine percent stated they had greater than 75% pain relief and a full 96% (25 of 26) had 50% or greater pain relief with Prolotherapy. Sixty-five percent noted they could only exercise 10 minutes or less before Prolotherapy, but after Prolotherapy this decreased to 6%. Before Prolotherapy, 65% considered themselves at least somewhat depressed and anxious. This decreased after Prolotherapy to 19% somewhat depressed and 15% somewhat anxious. Seventy-six percent taking pain medications were able to decrease the dosage by 50% or more. The need for additional pain management care also lessened by 50% or more in 77% of the patients after Prolotherapy. Eighty-eight percent of these patients stated, in regard to their pain, that they were at least somewhat better due to Prolotherapy. Fifty percent noted that they were radically better. Twenty three (88.5%) of the patients recommended Prolotherapy to someone else. Eighty-one percent felt that their lives were significantly better because of Prolotherapy. All 100% said that Prolotherapy changed their life for the better. Figure 11. Pain levels before and after Hackett-Hemwall dextrose Prolotherapy in patients who were told that surgery was their only option. Figure 12. Stiffness levels before and after Hackett-Hemwall dextrose Prolotherapy in patients who were told that surgery was their only option. A matched sample paired t-test was used to calculate the difference in responses between the before and after measures for pain, for the entire 145 low back patients, as well as the subgroup of fifty-five patients who were told prior to Prolotherapy that nothing else could be done with their pain, as well as the subgroup of twenty-six patients who told by their medical doctor(s) that surgery was their only option. The paired sample t ratio was computed on this pre-post Prolotherapy study. The paired t ratios for all the groups were highly significant, using N pairs minus one as the degrees of freedom. For the entire 145 low back study participants the paired t ratio was significant (t(144) = 22.5 p<.000001). For the subgroup of low back patients who were told that there were no other treatment options the paired t was also highly significant (t(54) = 26.3 p<.000001). The paired t ratio was highly significant also for the subgroup of low back patients who were told that surgery was their only option (t(25) = 23.8 p<.000001. In summary, for all the low back participants, as well as the two subgroups, their low back pain was significantly reduced at the p<.000001 level by Hackett-Hemwall dextrose Prolotherapy. 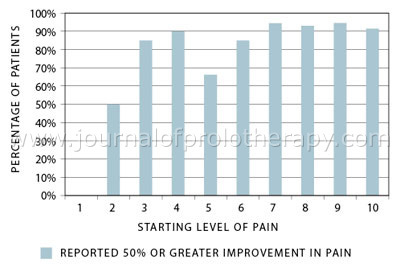 Post-study data revealed an average reported drop in pain of 2.9 points on a 10-point scale. This data showed an even greater average drop in pain of 3.9 for those patients who were told prior to Prolotherapy that nothing more could be done for their pain, or surgery was their only option. More than 80% of the study population reported improvements in mobility (walking and daily activities), exercise ability, anxiety, depression, overall disability, and the large majority (75%) were able to discontinue use of pain medication. When subjects were asked at one year follow-up whether their lower back pain improved following Prolotherapy, 98% answered yes. Former U.S. Surgeon General C. Everett Koop began advocating for insurance coverage of Prolotherapy in 1978 after it alleviated his chronic leg and back pain, but few inroads have been made. Most physicians are not familiar with the procedure, do not practice it, and therefore cannot attest to its benefits. Awareness of the procedure rose in 2005 when Dr. Robert Sheeler, medical editor of the Mayo Clinic Health Letter, lent his qualified support to its effectiveness for various types of joint pain, including that arising from the sacroiliac.49 Though several Mayo Clinic physicians now offer Prolotherapy as a treatment option, widespread understanding and acceptance of the procedure in the medical community is still in its infancy, and further research studies are needed to determine the extent of its benefits. Table 2. Summary of results of Hackett-Hemwall dextrose Prolotherapy back study. By virtue of its design, this pilot study cannot be compared to randomized placebo-controlled clinical trials. Instead, its aim was to document the response of patients with unresolved low back pain to the Hackett-Hemwall technique of dextrose Prolotherapy at a charity medical clinic. Multiple quality of life measures were assessed, including mobility, stiffness, range of motion, and activities of daily living, which, in addition to pain level, are important factors affecting the individual with unresolved low back pain. Decreased reliance on pain-relief medication was also documented. Because this data was collected from patients at a free clinic, no control group was used to validate the data collected, and no imaging studies are available to corroborate patient reports or provide clinical proof of improvements. Instead, the authors relied on the objective observations of the patients themselves regarding levels of pain and if and how their daily functioning improved. Given the size of the study group, it is likely that Prolotherapy, rather than other, concomitant factors not controlled for, is responsible for the improvements seen. The individuals participating in this study represent a typical cross-section of chronic low back pain patients, including gender, age, location and levels of pain/stiffness, and years of affliction. Before seeking treatment at the clinic, participants averaged four years and ten months of low back pain and had seen at least three physicians to resolve the problem. Prior to Prolotherapy, fifty-five (38%) of the patients said they were told there were no other treatment options for their pain and twenty-six (18%) of the patients said their medical doctor(s) believed that surgery was their only option. Adding to the study’s validity is the length of time between each patient’s final treatment and the follow-up interview. In the authors’ view, the one-year time frame was sufficient to gauge Prolotherapy’s long-term effectiveness. Because this was a charity medical clinic with limited resources and personnel, the only therapy provided was Prolotherapy, and treatments were given only at three-month intervals. In private practice, the Hackett-Hemwall technique of dextrose Prolotherapy is typically given every four to six weeks and often used in conjunction with a dynamic whole-body approach to pain relief. In patients who show little progress or who demonstrate poor healing capacity, the injection proliferants may be changed and strengthened, or additional actions recommended to improve overall health. Such complementary measures may include advice on diet, supplements, exercise, weight loss, changes in medications, additional blood tests, and other medical care. Most private-practice clients are also immediately weaned off of anti-inflammatory and narcotic medications that inhibit the inflammatory response needed to obtain a healing effect from Prolotherapy. Though cessation of medication use was highly recommended for all clinic study participants, not all patients were able to comply. Taking into account the lack of complementary therapies used during this pilot study, the results may indicate only the lowest level of success possible with Hackett-Hemwall Prolotherapy. Like all case studies lacking a control group to limit variables impacting outcomes, our study results are a snapshot only of the parameters evaluated and are necessarily subjective. The results are based solely on the answers provided by the participants to the questions posed by the questionnaire. No radiograph or MRI correlation for diagnosis and response to treatment is available, and a lack of physical examination documentation in the patients’ charts made categorization of participants into various diagnostic parameters impossible. Medication use, level of activity, and other pain management care during the course of treatment are variables that could influence results. What was documented were simple outcome measures that occurred prior to and following treatment with Prolotherapy. The Hackett-Hemwall technique of dextrose Prolotherapy, used on 145 patients who had an average duration of four years and 10 months of unresolved low back pain, was studied in this retrospective case series review for its effectiveness in relieving pain/stiffness and improving mobility. Study participants, interviewed 12 months following their last Prolotherapy session, reported clinically significant lower levels of pain, stiffness, and medication usage, as well as improved mobility and range of motion. Despite the limitations inherent in the study design, the authors believe that Prolotherapy is a viable treatment for unresolved low back pain. Future studies are needed to verify these preliminary findings. Flor H, et al. Etiological theories and treatments for chronic low back pain. I. Somatic models and interventions. Pain. 1985; 19:105. Bogduk N. Management of chronic low back. Med J Aust. 2004; 180:79-83. Shen F. Nonsurgical Management of acute and chronic low back pain. J Am Acad Orthop Surg. 2006; 14:477-487. Croft P. Outcome of low back pain in general practice: a prospective study. Br Med J. 1998; 316:1356-1359. Waddell G. A new clinical model for the treatment of low back pain. Spine. 1987; 12:632-644. Katz J. A randomized, placebo controlled trial of bupropion sustained release in chronic low back pain. J Pain. 2005; 6:656-661. Assendelft W. Spinal manipulative therapy for low back pain. A meta-analysis of effectiveness relative to other therapies. Ann Intern Med. 2003; 138:871-881. Cherkin DC. A review of the evidence for the effectiveness, safety, and cost of acupuncture, massage therapy, and spinal manipulation for back pain. Ann Intern Med. 2003; 138:898-906. Freeman B. Intradiscal electrothermal therapy versus placebo for the treatment of chronic discogenic low back pain. Spine. 2005; 30:2369-2377. Turner J, et al. Patient outcomes after lumbar spinal fusions. JAMA. 1992; 286(7):907-910. Schwarzer AC, et al. 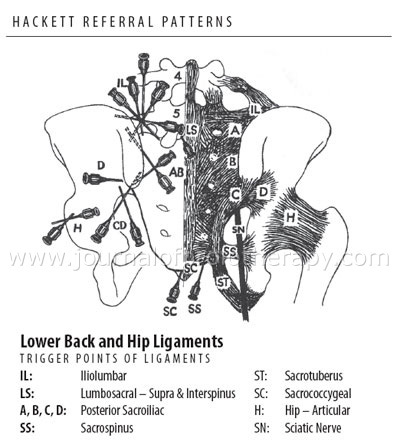 The sacroiliac joint in chronic low back pain. Spine. 1995; 20(1):31-37. Jensen MC, et al. Magnetic resonance imaging of the lumbar spine in people without back pain. New Engl J Med. 1994; 331(2); 69-73. Sheeler R. Alternative treatments: dealing with chronic pain. Mayo Clinic Health Letter. 2005; 23(4):1-3. Hackett G, et al. Ligament and Tendon Relaxation Treated by Prolotherapy, 5th ed. Beulah Land Press. Oak Park, IL, 1992. Reeves RD. Prolotherapy: present and future applications in soft tissue pain and disability. Phys Med Rehabil Clin North Am. 1995; 6:917-926. Ongley M. Ligament instability of knees: a new approach to treatment. Man Med. 1988; 3:52-154. Hackett G. Prolotherapy in whiplash and low back pain. Postgrad Med. 1960; 27:214-219. Kayfetz D. Occipital-cervical (whiplash) injuries treated by Prolotherapy. Med Trial Tech Q. 1963; 9:9-29. Merriman J. Prolotherapy versus operative fusion in the treatment of joint instability of the spine and pelvis. J Int Coll Surg. 1964; 42:150-159. Hackett G. Shearing injury to the sacroiliac joint. J Int Coll Surg. 1954; 22:631-639. Hackett G. Referred pain and sciatica in diagnosis of low back disability. JAMA. 1957; 163:183-185. Hackett G. Joint stabilization: an experimental, histologic study with comments on the clinical application in ligament proliferation. Am J Surg. 1955; 89:968-973. Gillies J, et al. The mystery of low back pain. Canadian Journal of Continuing Medical Education. 1997:55-68. Caillet R. Low Back Pain Syndrome, 2d ed., F.A. Davis, Philadelphia, 1972. Schwarzer A. The sacroiliac joint in chronic low back pain. Spine. 1995; 20:31-37. Hackett G. Shearing injury to the sacroiliac joint. J Int Coll Surg. 1954:22:631-639. Bellamy N. What do we know about the sacroiliac joint? Semin Arthritis Rheum. 1983:12:282-313. Hauser R, et al. Prolo Your Sports Injuries Away! Beulah Land Press, Oak Park, IL, 2001. Nicolas J. The Lower Extremity and Spine in Sports Medicine, Mosby, St. Louis, 1986. Hackett G, Ligament and Tendon Relaxation Treated by Prolotherapy. Charles C. Thomas; Springfield, IL; 1958. Hackett G. Referred pain from low back ligament disability. AMA Arch Surg. 1956; 73:878-883. Gracovetsky S. The Spinal Engine. Springer-Verlag, New York, 1988. Boden S. Abnormal magnetic resonance scans of the lumbar spine in asymptomatic subjects. J Bone Joint Surg Am. 1990;72(3):403-408. Hauser R, et al. Prolo Your Back Pain Away! Beulah Land Press, Oak Park, IL, 2000. Hackett G. Referral pain and sciatica in diagnosis of low back disability. JAMA. 1957; 163:183-185. Echow E. A randomized, double-blind, placebo-controlled trial of sclerosing injections in patients with chronic low back pain. Rheumatology. 1999; 38(12):1255-1259. Klein RG, et al. A randomized double-blind trial of dextrose-glycerin-phenol injections for chronic low back pain. J Spinal Disord. 1993; 6(1):23-33. Yelland MJ. Prolotherapy injections, saline injections and exercises for chronic low back pain: a randomized trial. Spine. 2004; 29(1):9-16. Dagenais S. Intraligamentous injection of sclerosing solutions (Prolotherapy) for spinal pain: a critical review of literature. Spine J. 2005; 5:310-328. Klein R. Proliferant injections for low back pain: histologic changes of injected ligaments and objective measures of lumbar spine mobility before and after treatment. J Neurol Orthop Med Surg. 1989; 10:141-144. Schwarz R. Prolotherapy: a literature review and retrospective study. J Neurol Orthop Med Surg. 1991; 12:220-229. Schmidt H. Effect of growth factors on proliferation of fibroblasts from the medial collateral and anterior cruciate ligaments. J Orthop Res. 1995:13:184-190. Liu Y. An in situ study of the influence of a sclerosing solution in rabbit medial collateral ligaments and its junction strength. Connect Tissue Res. 1983; 2:95-102. Maynard J. Morphological and biomechanical effects of sodium morrhuate on tendons. J Orthop Res. 1985; 3:236-248.